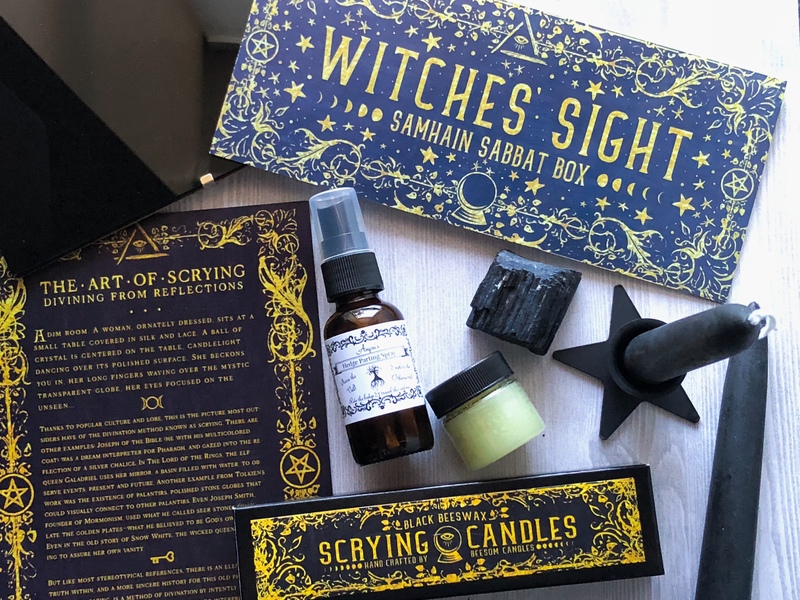 Sabbat Box is a great subscription box that comes out around the Sabbats. There are eight a year and each one is filled with amazing items specifically for each Sabbat. This year’s Samhain box has the theme Witches’ Sight. I thought this was a great theme for this specific sabbat! It’s full of items to aid in scrying and divination. No box that focuses on scrying work would be complete without candles. These pair of candles are made by Be(e)som Candles. Also the black beeswax candles come in a custom designed box that match the other Sabbat Box artwork. Everything in this box correlates with the other pieces and this spray is no exception. This spray by Light of Anjou was made just for Sabbat Box. Not only can it be used in your sacred space before a ritual, it can also be used to physically and spiritually cleanse your scrying mirror. Inside the bottle you’ll find wormwood and mugwart infused witch hazel, vodka, and vinegar. Even more, there are also nutmeg, sandalwood, and sweet orange essential oils. When I sprayed it to test, my first thought was that it smelled similar to Worcestershire sauce. However the scent did not linger. A scrying mirror is the most important tool in this sabbat’s box. Blue Moon Broom, Brush, and Besom created the frameless 5×7″ mirror. It comes with a gorgeous info card, instructions and a black velvet bag to keep it all in. This is a pretty unique item for a subscription box and I’m glad it was included, along with the info card. Unfortunately with all the strange activity going on in my house, I will probably have to put this away and save it until I have all of that sorted out. This small black star (or pentagram) candle holder might actually be my favorite item in the box. It’s the perfect size for the accompanying candles as well as many other candles I’ve received in previous boxes. They are made by Azure Green and have a black fireproof coating. They are simple and stylish. If you’re going to be working divination then a black tourmaline crystal is a must have. It’s properties will help protect and shield you while you work. This flying ointment was hand crafted by Alchemy and Ashes. An aid in divination work this ointment will help you connect to the unseen worlds around. It can be used in meditation, astral travel, and dream work. It’s made with mugwart, wormwood, and vervain with anise, frankincense, and lavender essential oils. Overall I think this is a perfect Samhain box to expand your knowledge and practice this fall. Please note, this will be the last Sabbat Box for the year. We may go back and cover previous boxes that we weren’t able to post about while we wait for next year’s Imbolc box!